Update: As frustrations mount with Columbia Gas, the utility provider linked to the fires and explosions, Gov. Charlie Baker has declared a state of emergency in the Merrimack Valley. Eversource has now been tasked with recovery efforts in the affected communities. Earlier: The day after an unprecedented disaster in Lawrence, Andover, and North Andover that saw homes destroyed in gas explosions and burned in dozens of fires, thousands of families are working to put the pieces back together Friday. One man died in the chaos that erupted there Thursday evening. Leonel Rondon, 18, of Lawrence, was killed when the chimney atop a house toppled onto his car, authorities said. There were more than two-dozen other reported injuries. Schools and state offices remained closed in the three communities. It still wasn’t clear how all of this happened, but officials suspect an overabundance of pressurized gas running through the cities’ aging pipes was to blame. By the latest count, at least three homes blew apart after gas built up inside, and fire departments from all around the region responded to between 60-80 fires, according to The Eagle Tribune. 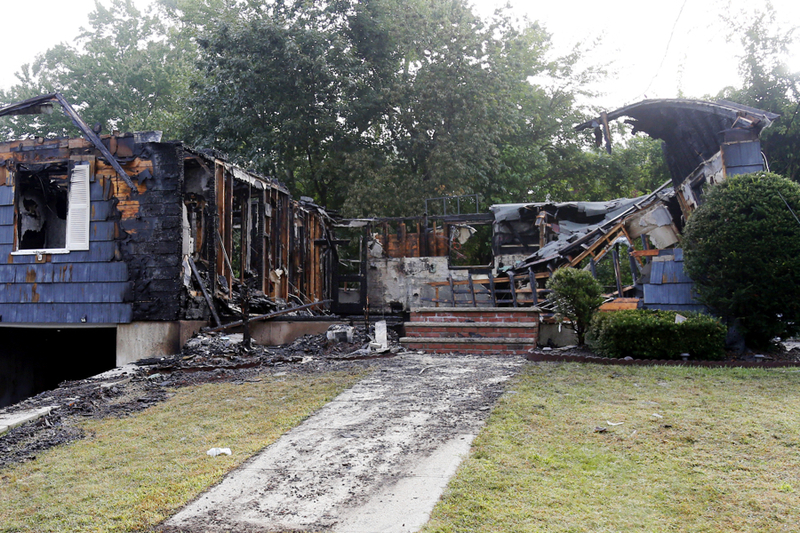 “It looked like Armageddon,” Andover Fire Chief Michael Mansfield remarked at a press conference. Utility company Columbia Gas had still not provided a thorough explanation of exactly what went on, but provided a statement on the company’s website describing the recovery as “an extended restoration effort” and advising its customers to flee their homes and not to return unless accompanied by a technician. The company had reportedly been working on gas lines in the area this week. It said 8,600 customers were affected. Officials said representatives from the company would provide an update directly at some point later Friday. What happened in the Merrimack Valley yesterday was a tragic incident. We are saddened to learn of the death of a young man as a result of these events . Our thoughts and continued support are with those who have been injured and affected. We are focused on providing as much support as possible to our customers, residents and communities. We are grateful for the community’s patience, as well as the tremendous support we have received from our first responder and law enforcement partners. We urge customers in the affected area to call us and arrange for us to meet you at your property to make sure the house is cleared and your gas meter is shut off. Please provide us with your name, address and cell phone number so we can call you when we are ready to access your property. If you don’t provide us with a cell phone number, please call 1-866-388-3239 to schedule a time to meet you at your property so we can gain access. Residents evacuated the communities on Thursday, as crews cut electricity to aid in the response. MBTA Commuter Rail service was replaced with shuttle buses on the Haverhill Line, with service continuing only between North Station and Reading, according to an update posted to the T’s website Friday morning. Haverhill Line trains will operate only between Reading & North Station on Friday. Buses will run from Haverhill & Bradford to Anderson/Woburn for inbound service on the Lowell Line. Consider service on the Lowell or Newburyport Lines as an alternative. Passengers needing service to Haverhill and Bradford can take Lowell Line trains to Anderson/Woburn and transfer to a shuttle bus. The bus will only go to Haverhill and Bradford due to road closures. Parking at Anderson/Woburn Station will be free on Friday and passengers are encouraged to utilize this large parking lot for service on the Lowell Line. Additional capacity will be added for anticipated heavier ridership. The Red Cross responded last night and continue to provide services to those affected, staffing impromptu shelters at schools and community centers. The MPSCA has opened its doors to animals in need of shelter at its Nevins Farm location in Methuen, where it has already taken in several pets. It was also soliciting donations of food and supplies. Pets in need of medical care can be brought to its hospitals in Jamaica Plain and Waltham. The Boston Globe compiled a list of other outlets for those who wish to help impacted families.